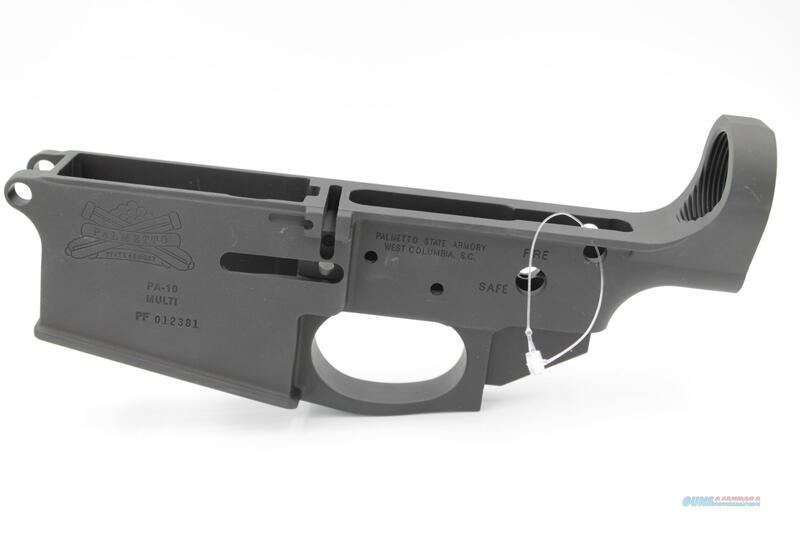 Description: Palmetto State Armory PA-10 .308 Stripped Lower Receiver. New, with a few scruffs. It is up to the buyer/bidder to determine if the firearm is legal in your area prior to your purchase. All firearms listed will ONLY be shipped to an authorized FFL holder, that the buy/bidder must specify. A copy of their FFL *MUST* be faxed or emailed to us prior to shipment. Please review the photos and if you have any questions, please email us. In-state sales require sales tax and must have either a Nebraska handgun permit or Nebraska conceal and carry permit. Acceptable payment methods are: Visa, MasterCard, and Discover. Once payment and FFL have been confirmed, firearm will ship. Payment must be received within 5 business days of the invoice date or the sale will be cancelled and buyer reported as a "non-paying buyer", unless you have made other payment arrangements with us. Buyer MUST have the receiving FFL fax or email a copy of their FFL to us prior to shipment. We ship to the 48 contiguous United States. No shipping to Alaska or Hawaii. ALL FIREARM SALES ARE FINAL. No returns once FFL transfer is complete. All firearm and warranty issues must be handled directly with the manufacturer. Please note that the sale of firearms is restrictedFirearms must be shipped to a Licensed Federal Firearms Dealer in your state of residence.It is YOUR responsibility to determine if the firearm and the magazine is legal in your state before you order.Your FFL must e-mail their license to us before we ship the firearm *Refer to your state laws and regulations prior to purchasing. All firearms are as pictured and are non-refundable. * It is up to the buyer/bidder to determine if the firearm is legal in your area prior to your purchase. All firearms listed will ONLY be shipped to an authorized FFL holder, that the buy/bidder must specify. A copy of their FFL *MUST* be faxed or emailed to us prior to shipment. In-state sales require sales tax and must have either a Nebraska handgun permit or Nebraska conceal and carry permit. Acceptable payment methods are: Visa, MasterCard, and Discover. Once payment and FFL have been confirmed, firearm will ship.